Jenni Olson's The Royal Road, which recently arrived on DVD and VOD via Wolfe Video, is a movie whose actual scale is nearly impossible to discern. It's clearly a minimalist work, composed of static, long-take 16mm landscape shots paired with Olson's lyrical voiceover, and it's brief, running just 65 minutes. But it's also a film of expansive ambition, tackling the Spanish conquest and colonization of California, the mythical power of classic Hollywood, and the value of nostalgia. These 65 minutes are the result of a 20-year process. Loosely following Junipero Serra's titular trail between San Francisco and Los Angeles, and privileging landscapes over people, The Royal Road meanders gracefully and poignantly. Its unusual structure brings to mind the confessional irony of Ross McElwee and Agnès Varda, the essayistic playfulness of Chris Marker and the historical rigor of Thom Andersen. Olson's narrative through line is a longing for unavailable women. 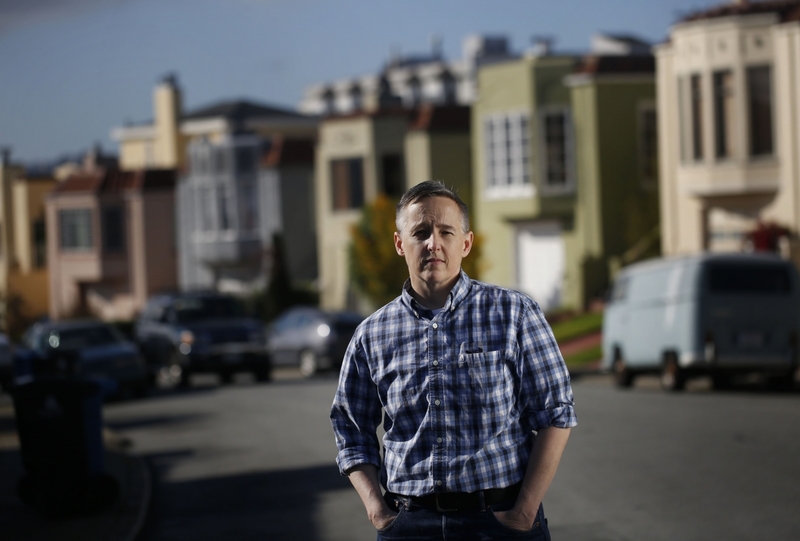 "Like Alfred Hitchcock," Olson says in the film, "I want to tell you a story about love and loss and San Francisco that reveals more about me than I ever expected to say." When not inhabiting the film's onscreen persona, Olson is also a renowned historian of LGBT cinema, and the VP of e-commerce at Wolfe Video. This month, we spoke by phone to discuss the process of making The Royal Road. How did your camera avoid people, and, as you put it, "crop out the contemporary"? Can you tell me about the process of shooting this film? We did a lot of shooting early in the morning, at the crack of dawn when there weren't so many people out in the streets. I have been shooting this film since 1997, and there were fewer people in San Francisco 20 years ago. So it was a little bit easier. And since it's not sync sound, if we saw someone coming, we could just say, "Would you hang on a minute while we finish this shot?" I'm interested in trying to capture images that look the way the city might have looked 50 years ago. We very intentionally cropped out things like billboards and yellow crosswalks. I also have an affection for vintage technology. Things like telephone poles. I think the viewer comes away after 65 minutes of spending time in this landscape feeling a sense of calm. Because they have spent all this time not being accosted by markers of the contemporary, which is billboards shouting at us from every direction. Things like bus ads. Things that grab our attention and distract us from the landscape that we really live in. Did the images precede the text? I work simultaneously writing and shooting. My shtick as a writer is this first-person monologue, a kind of intimate, confessional pining over unavailable women. And hopefully there's some humor in it. I have a general sense that the visuals that accompany it are going to be somewhat general, mundane urban landscapes. I know the atmosphere that I want, so I can go out, find a great shot and get a really long take. Then I have lots of footage to work with. And there are specific things in the script. In the case of The Royal Road, I knew that I wanted a bunch of statues of Junipero Serra, and I wanted shots of Mission Dolores to go with that section—specific things where the image should match up with the text. And then I will write a whole script and get a sense that it feels like it has a beginning, middle and end, then record the voiceover and lay it down, and then put picture on top to see if it works. Like most films, it comes together in the editing room, but in ways that I don't completely know before we start laying down the picture. I shoot on film, and my cinematographer is Sophie Constantinou, who lives two blocks away from me. So I make lists of shots and then we'll say, "Let's go out at six o'clock in the morning." And then we drive around and get it all. The total amount of footage I have is still only like five hours. Any regular documentary filmmaker will have 500 hours, right? Even shooting for almost 20 years, that's still not very much footage. This is in some ways a well-researched social justice documentary, in some ways a lecture on film history, in some ways a personal essay. What appeals to you about in-betweenness? Would you have had any interest in making these three films separately? I love the way you phrased that. I do always feel like my films are jam-packed. I studied film history and theory at the University of Minnesota in the late '80s, and I remember seeing Breathless and [learning] that Godard said he wasn't sure he would ever get to make another film - so he put everything into Breathless. Sometimes I feel like that. And I guess I have a lot to say in a lot of different modes. But I think the main thing is that I'm interested in different kinds of storytelling form. I don't want to make a conventional documentary or a conventional narrative, or even a conventional experimental film. For whatever reason, I've just always been drawn to the format of 16mm urban landscapes with voiceover, and the freedom of that - that you can just say anything you want. It's an essay where you speak from the personal and engage with the political. You're conveying yourself as you're conveying what you have to say about the world. There are so many great films of every genre made in and about California. What appeals to you about the so-called Golden Age of Hollywood? Why are Vertigo and Sunset Boulevard your touchstones? The Royal Road is engaging with nostalgia. I'm trying to complicate the concept and redeem it as in fact a way to connect with ourselves now, in the moment. I don't want to be a luddite. I don't feel like that's what it is. I feel like I'm going through this elaborate intellectual exercise to rationalize my own nostalgia. The thing about Vertigo…it is so melodramatic that you can kind of see why it was not that well received when it first came out. There are aspects of it that are like, Oh my God, this is so cheesy. But over time it becomes such a rich text. There are so many different ways to engage with it. And I find that I still have an experience every time I see it where I can't quite remember how it all unfolds. And so, there's this sense of seeing it for the first time every time you watch it, which has to do with the very topic that it's engaging with around memory and nostalgia. It's a perfect text for me because those were the things that I was engaging with in the rest of my film, and this idea of wandering the landscape of San Francisco. And pining over two unavailable women—of course, Jimmy Stewart is also pining over two unavailable women. So there are these great parallels. In visual terms, it seems clear to me that you're infatuated with San Francisco in a way that you aren't with Los Angeles. Is it because you sense a major aesthetic difference between the two cities? No. I actually I love LA and I loved shooting there. It's really more a result of the fact that I live here in San Francisco and I spend more time here and it was easier. There are shots in my film that are out the back window of my house and standing in front of my house. And others describing all the places I drive past when I drive my kids to school. You know, I shot twice in LA and actually both times I had problems with the camera that we rented. So there were technology and budget issues. But I love LA and I love the light there, the landscapes and the experience of all the Hollywood history. 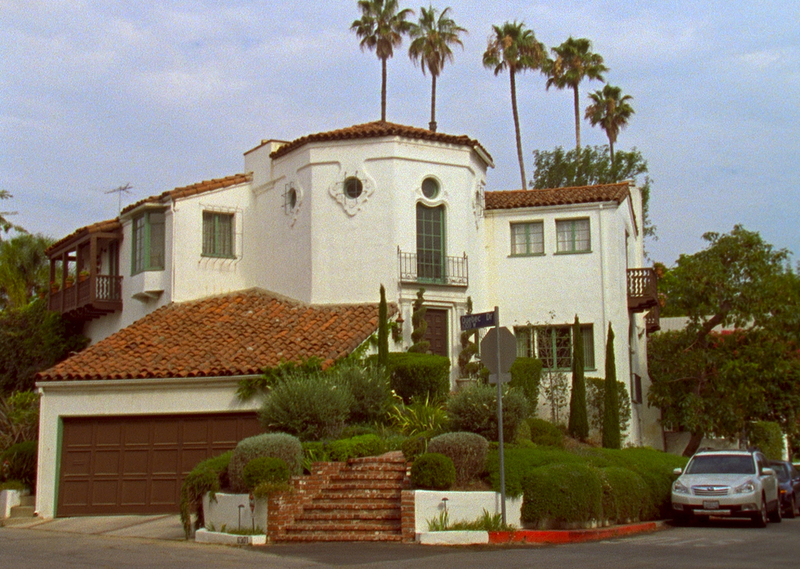 The second opening shot of The Royal Road is a shot of the apartment where William Holden lives in Sunset Boulevard, at Franklin and Ivar. I come down to LA every so often for Outfest, and whenever I'm there I'm always driving around location-scouting. There's a shot in the film of Barbara Stanwyck's house from Double Indemnity. And I did a really great shot of the American Beauty house that Kevin Spacey used, which didn't fit in the film. To go back to what we were talking about at the very beginning, I also loved the idea that on the most pure level, it's a documentary about the landscape itself. You could watch it with the sound down and just think, Wow, that's what California looked like.